After installing my new USB serial adapter and being able to key my 2m transceiver's PTT line once again, I noticed that a full moon would be coming up the following evening and thought it would be interesting to see if my old, but simple system, was still capable of working stations off the moon. In early 2007, I decided to try 2m moonbounce using WSJT's JT65B digital mode. Over the years, moonbounce has gradually drifted away from CW to the much less demanding weak signal digital mode, allowing smaller stations to still explore the excitement of exchanging signals via reflection from the lunar surface. I am fortunate to have an excellent QTH for such an endeavour, being located beside the ocean with a saltwater horizon favoring moonrises, especially during the winter months of more northerly lunar declinations. Theoretically, the ocean horizon produces about 6db of added gain to my system, making my 9el yagi produce gains approaching 19dbd ... about 2dbd more than a 24 element yagi and similar to a box of four 9el yagis mounted in an H-frame. I soon realized that the actual numbers appeared very close to predicted values and using an inexpensive 2m FM/SSB 'brick amplifier' (with built-in GasFet preamp) delivering approximately 140 watts, I was able to work 54 different stations over the next twelve months. All of the stations worked were doing the heavy lifting, with the majority running typical 4-yagi H-frame arrays using yagis from 6 to 17 elements each. I did work one station that was using two small yagis during a period of excellent conditions. Somewhat surprisingly, a large majority of the stations I worked were strong enough to be heard audibly from the transceiver's speaker. I'm always amazed at the truly small amount of RF energy that is actually left, after the round trip to the moon ... yet information can still be exchanged. On 144MHz, the round trip losses are a minimum of 250db. Factoring-in my antenna's gain and ignoring the coaxial losses in 70' of RG213, there is a scant 1.56 x10^-9 W arriving at the moon ... that's .00000000156 W! Considering how much RF is absorbed in the lunar dirt and what's left over for the -125db home trip, it's a miracle that some signals are loud enough to be heard by ear at all. EME is really one of ham radio's most fascinating activities. Reacquainting myself with the newer version of the JT65B software, and testing out the system, I was ready to go on the next evening's moonrise. Unfortunately the moon was rising just a little too far south to give me a really clear shot and I would be pointing into the next door neighbour's trees. Being unable to track the elevation, my operating time is limited to about two hours per session, over a period of several successive days (or nights). Almost coincidental with the night's moonrise, I heard the strong signals of RX1AS (Alex) in St. Petersburg, calling CQ. I called him and he came right back with my signal report. 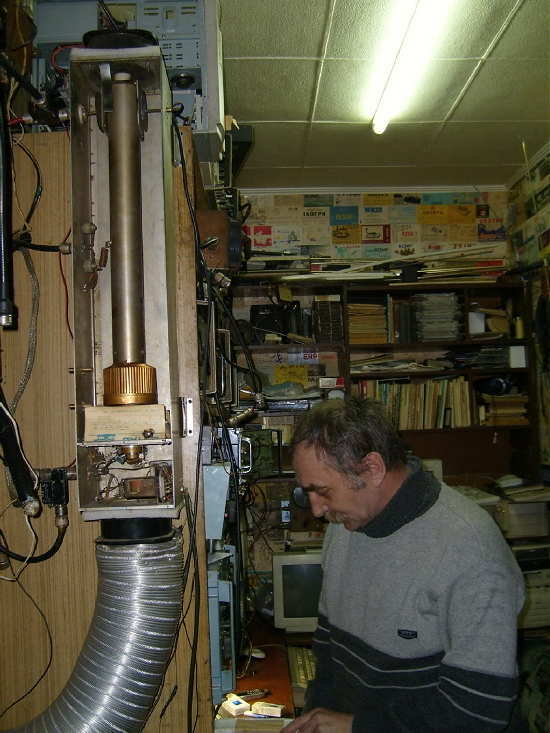 His station is shown below, along with his large homebuilt strip-line amplifier. The next station I worked was DL8FBD (Gerald) near Frankfurt ... a new 'initial' for me, #55. The following evening, the moon was buried even deeper into the trees but initials #56 and #57 were worked ... YL2GD (Gunars), in northern Latvia and RX3A (Nikolay), in Moscow city. Nikolay was worked with the moon at 11 degrees above the horizon. I'm not sure just what my upper limit for lunar elevation might be with this small antenna but the highest elevation I have worked anyone was at 18 degrees. The third night found less activity on the band as well as a more southerly moonrise, burying my target even further into the neighbour's trees. Few signal were heard but one contact was easily completed with I3MEK (Mario), near Venice ... initial #58. Mario's signal, shown here on the waterfall display, comes from his four 19 element yagi array and 1 kW amplifier. His signal peaked at only -21db, indicative of the poorer conditions and heavier tree line obstruction. I've contemplated building a small 500 watt amplifier which would give me another 6db ... really a huge increase when it comes to EME, but I'd still be stuck with the same receiving capability. Having more power might put me in the position of being heard better but not being able to hear other stations any better. At my present power level, there appears to be an entire new crop of stations within my present reach, that weren't around in 2007 ... but constructing the amplifier would be a fun project! With so many larger (four or more yagis) stations around the world, a huge antenna is not needed to have success on 2m JT65B moonbounce ... nor is an over-the-ocean moonrise. I've also been able to work stations on moonset where I am pointing over hilly terrain and trees, nowhere near the ocean. The WSJT (JT65B mode) software is freely available and very easy to implement, but spend some time reading the manual and playing with the software first, perhaps getting used to QSO procedures on 20m. If you are running a small FM/SSB amplifier on 2m, such as the typical 'brick' I have been using, make sure to add a blower to keep the heatsink cool, as JT65 has a 100% duty cycle and these small amplifiers can get hot pretty fast. 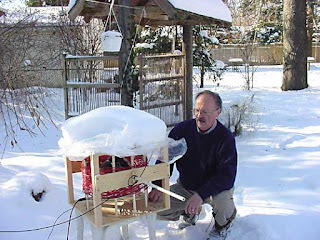 I use a small squirrel-cage blower from an old microwave oven to direct a blast of air onto the cooling fins. Wondering where to point your antenna? One handy site that will provide the moon's position in the sky, for any time and any location, is the U.S. Naval Observatory's 'Sun or Moon Altitude/Azimuth Table'. As well, you can keep abreast of real-time activity or set up skeds, via NØUR's Ping Jockey JT65 EME page. If you do decide to give this a shot, I'd be interested to hear how you do ... maybe your system is big enough already to let us work each other via the moon. 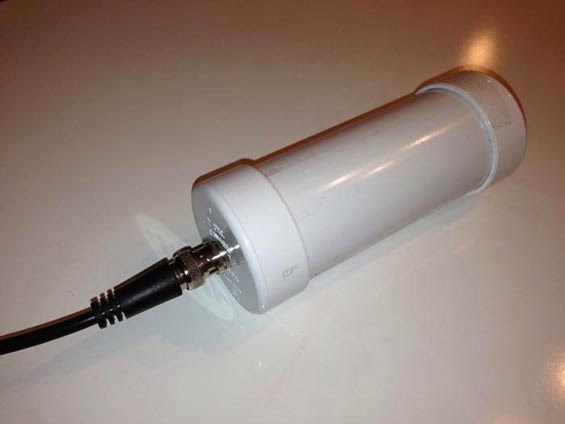 Back in 2007, when I first experimented with single-yagi 2m moonbounce, I constructed an interface that would allow my aging laptop to communicate with my equally aging Icom 821 transceiver. Back then, the shack's old Toshiba laptop (running Win98SE) had a serial (RS-232) communications port and my homebrew interface would let the WSJT software key the PTT line, as well as handle the required 'in' and 'out' audio. 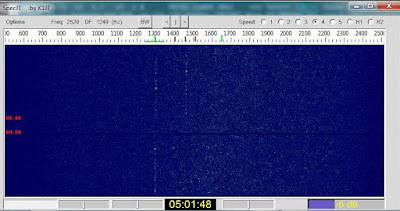 Fast forward to 2016, when the monthly sight of a full moon rising over the ocean, once again refuelled my interest in trying some possible EME with my 9 el yagi ... but, like the dodo bird, serial ports have long vanished from most new computers and a new way of keying the 2m radio would need to be found. I would also need some method of keying the PTT line of my HF transceiver, should I wish to build a 630m transmitting converter for modes such as JT9 or WSPR. The 2m Icom has no audio VOX , so to key the radio via the WSJT audio tones, I would need to build a simple VOX system that would key the PTT-line. All things being equal, I didn't really like this idea since it would likely result in 'hot-switching' of the changeover relays and eventually lead to problems. 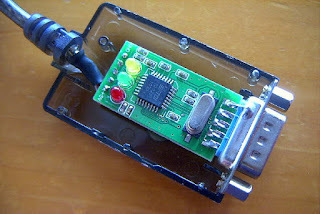 I investigated the alternative method of hard keying the PTT via the USB port, using a USB-to-serial port adapter, but these were not entirely without problems either. It seems that certain chipsets were worse than others but the FTDI style were less prone to compatibility problems. I also considered purchasing a Signalink USB interface which would take care of the PTT keying as well as the audio. After researching the Signalink, I found some disturbing reviews that indicated the onboard sound card could create some significant signal-to-noise degradation when used for weak-signal work ... such as EME. The generated noise would likely never be noticed when used on the noisy HF bands, which probably accounts for most Signalink applications, but on weak-signal moonbounce, every db is precious and an elevated noise floor from the sound card would definitely not be helpful. Further research indicated a really nice line of interfaces being built by Johnny, G3LIV. He offers several models to suit various needs and none seem to include a sound card, which would eliminate the possibility of unwanted noise being introduced ... but before making a decision, I made one final attempt at finding a cheaper solution. 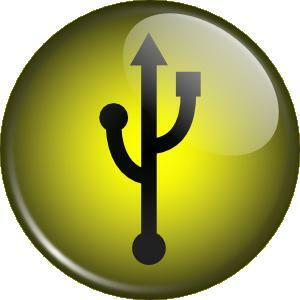 An E-Bay search for an FTDI USB serial port adapter brought up several offerings worldwide, with the majority being in the far east. I found one promising looking low-volume dealer in China, that not only offered the device for $11.99 with free-shipping, but also had a 100% feedback rating and no complaints, ever! What the heck. It was the right chipset, assuming it wasn't counterfeit, the price was right and the dealer looked to be doing his best to offer a good product ... I placed the order and three weeks later the adapter arrived. 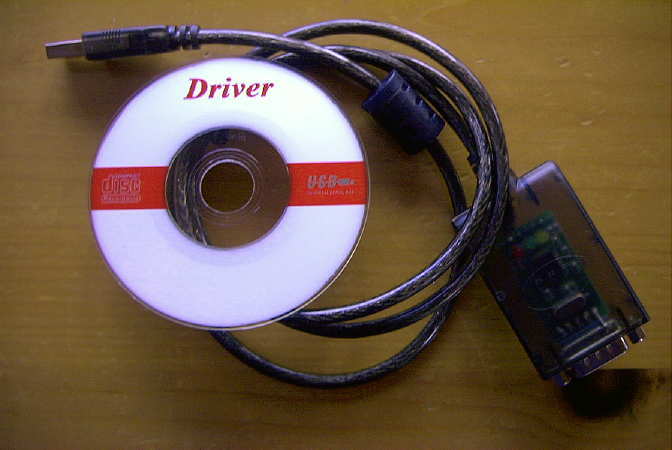 The adapter was well packaged and included a small CD containing the necessary USB drivers for several different operating systems, including my newer laptop's Windows 7. I plugged the adapter into an empty USB2 port and sent the device manager to search the CD for the needed files, which it quickly found and installed. The software created a virtual serial port, assigning the adapter to COM port 3. I then set the WSJT switching tasks to COM3 and connected my homebrew interface to the adapter via its DB9 serial connector. To see if the new adapter would really work, I instructed WSJT's JT65B software to turn on the transmitter before sending a test tone, which hopefully would key the PTT line ... and it did! It seemed that my $11.99 investment was doing the job perfectly. Thankfully, none of the online horror stories that I had encountered regarding USB serial port adapters, had been encountered. If you need something of this sort, I can recommend this particular product as well as the E-Bay seller. If you are starting from scratch, the entire interface could be easily built, using new parts, including the USB adapter, for just a few dollars and I may, in fact, re-package everything into one compact box, USB adapter and all. This coming weekend will see another CLE challenge, this time in the 15 kHz slice from 370.0 - 384.9 kHz. This is a somewhat dreaded range for me since my local blowtorch NDB, 'AP' (378 kHz), sits right in the middle of the range. 'AP' is located at the entrance to Active Pass, the main ferry route to Vancouver Island, and the antenna is about 3/4 of a mile from my location. Needless to say, the beacon is about 40db over S9! With careful loop nulling, I can reduce this by about 25db but it's still an enormous signal to deal with. when we listened on these same frequencies. (not in an attachment) with 'CLE204' at the start of its title. # The date (e.g. 2016-02-26, etc., or just 26) and UTC. March at the very latest. I admit it. I have an extraordinarily kind next door neighbour! Ever since erecting a new, much bigger LF antenna several years ago, she has allowed me to run its large, three-wire 100' tophat, directly over the top of her house to a tree on the far edge of her property. As well, she removed her only light dimmer, knowing that it was creating a LOT of nasty RF 'hash' throughout the LF / MF spectrum, seriously degrading my LF reception. 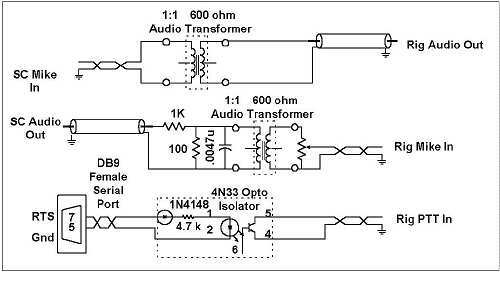 To hear the RF noise-signature of a typical light dimmer, listen here, on the ARRL's helpful page of 'household' RFI recordings ... that's just how it sounded here as well! She recently did a major renovation, which included a new multi-light dining-room fixture and expressed to me a desire to be able to dim it ... oh-oh, I was definitely not looking forward to this. 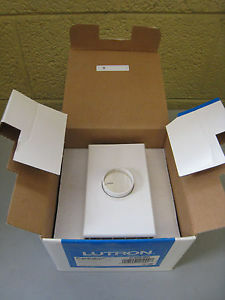 I did a little web-research and soon learned that some of the most RF-quiet dimmers were being produced by Lutron. One model in particular, claimed to pay special attention to RF noise-filtering and that was the "Centurion", whose smallest model is a 600 watt-capable unit, with a large finned heatsink front plate ... model #C-600P-WH. I decided to order one from the only dealer I could find in Vancouver that seemed to carry this line of dimmers. The cost was just a little over $40 Canadian (sells for about $25 in the U.S.A.) ... cheap enough if it would do the job! When the unit came in, I picked it up on my next ferry trip to the city and upon my return, installed it the following afternoon. Before doing the installation, I fired-up the receiving system, tuned to 300kHz, and with the baby monitor set up beside the speaker, took the portable monitor with me. After installing the new dimmer, I turned on the baby monitor, held my breath ... and turned on the light fixture. Wow ... not a trace of hash could be heard! Adjusting the dimmer from high to low produced no difference in the noise level. I later did a more thorough bandscan and could find no evidence of RFI, on any frequency. The only RFI that I could detect was when placing my Sony ICF-2010 close to the actual dimmer. I was unable to detect any noise further than 6" away from the lights or the dimmer! So it seems that this model can be highly recommended, for your own home or if you have a next door neighbour 'light-dimmer problem'. I suspect there are probably a lot of Canadian amateurs still thinking that our new 630m is not very practical for anything other than local two-way contacts. During the winter 'DX season', this is definitely not the case, as 630m shares many, if not all, of the propagation characteristics found in the lower end of our AM broadcast band. As well, a quick tune through the even lower NDB band on a normal night will reveal dozens of 25-watters, often from over a thousand miles away and with very robust signals. With no 630m amateur activity yet coming from VE6, VE5 or VE4, it is difficult to get a sense of just how interesting the band could become on these normal nights, or how great it would be on a really good night of propagation. My recent CW contact with the nearest out of province station, VE3OT (Mitch), on a normal night, demonstrates that there is a lot of potential for some really effective two-way work over long distances. So ... what do signals sound like between here and Ontario? 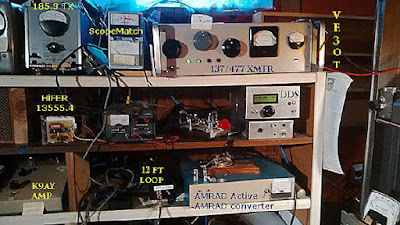 Here is Mitch's CW beacon as heard here on the evening of February 11th, at around 2300 hours local time, using my 10' x 20' loop. I have heard Mitch at even higher levels than this, but his beacon is usually audible here on most undisturbed nights, sometimes as early as 2000 hours local time. 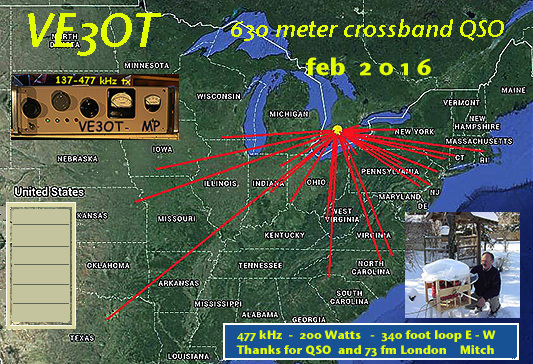 His beacon signal runs 200 watts to a 340' circumference loop, from his London, Ontario, suburban backyard. Even if you are not able to hear Mitch's signal audibly, it should be fairly easy to copy in one of the QRSS CW modes, such as QRSS3 or QRSS10 ... both of which could yield a reasonably quick two-way contact. Judging from the reliability of the VE3 signal, any activity from the prairie provinces should be even easier to hear. Should any of you in the prairies take up the 630m challenge, I can assure you that you'll be very, very popular out west ... every night! This blog also provides an opportunity for my initial use of the 'tunestotube' web site. It provides a nice online interface for posting audio files to Youtube, along with an image, or a slideshow. It seemed to work seamlessly and will save me having to link to audio files stored on my own web site, which really eat up what little space I have left. 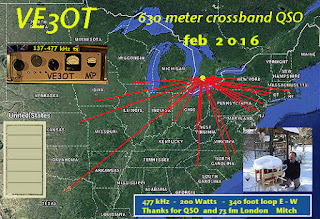 Both Mitch and myself had been alerted to the excellent propagation earlier in the week, when VE3OT's CW beacon had reached S9 levels here for several hours on two consecutive nights ... but any late-night QSO attempts would have to wait until the weekend, when having to get up in the middle of the night would not conflict with Mitch's workweek schedule. Our first attempt, late on Friday night and 3A.M. for Mitch, found that conditions had deteriorated from midweek's enhanced propagation and the low signal levels, combined with some unseasonal lightning noise, resulted in rescheduling for another shot on Saturday. Late Saturday night found the band much quieter and propagation much improved, but not as good as it had been earlier in the week ... somehow Murphy always seems to have a hand in pre-planned events, and it's never a helpful one. Mitch's beacon signal was readable here but had a deep ten-minute fade cycle with a short-lived peak before fading out to nothing. Hoping to take advantage of one of the peaks, we began short two-by-two calls from both sides shortly after 0700Z. I eventually heard Mitch fade up and sending a '339' signal report but my response and '559' signal report to him went unanswered as he had faded away again. I continued the short calls, along with my signal report to him and on the next peak heard him responding with 'RRR and 'QSL'! This time his signal continued to build and we had several short exchanges, with Mitch upgrading my RST now to '549' and with me advising of his stronger '569' signal. As the fade cycle took its grip once again, we exchanged our '73's', 'TU's' and 'SK dit-dit's', while we still had the opportunity ... I can't speak for Mitch, but for me it was a truly exciting contact and one I'll not soon forget. I'm sure the opportunity to work again will present itself fairly regularly as we both know that Saturday's conditions were not the best. It will be interesting to try again when signal strengths reach the levels previously heard during the week. For those of you that worked VE3OT during the recent 630m crossband event, Mitch has put together a very special QSL card! As the solar cycle winds down, the 'good' nights will happen more often, as will the truly 'great' nights. Hopefully there will be more Canadians on the band to take advantage of what lies ahead. Hopefully the U.S.A. will soon have the band as well, which will really spark nightly activity. What is really needed right now is more Canadian activity, especially in the western provinces, where nightly CW contacts could be readily made. Time to reach for the solder iron! There are several VE7's, and one VE3, waiting and wanting to work you! A recent blog posting of four videos showing the installation of a new (Roelof-made) PAØRDT active E-probe antenna revealed that there appeared to be a difference between his earlier model and his latest. It was noticed that the noise ingression levels were different between them, with one showing less noise on LF than on HF, while the other one behaved just the opposite. 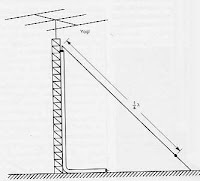 The newer PFU has the antenna ground isolated from the receiver's ground while the older one does not. Noise coupling, with the new one was higher on HF and lower on LF, which was just the opposite of what was noted with the older unit with its un-isolated ground ... overall LF performance over the newer system was deemed to be better as seen in the final video here. The only difference seemed to be in the coupling isolation transformer, used in the power feed unit (PFU), likely similar to the one shown at the bottom of this page. The isolating transformer consists of two bifilar windings on a high mu core. My guess is that the interwinding capacitance spoils the isolation at HF. I have just tested an isolating transformer with two separate windings opposite each other on the tiny core. Sure enough, this solves the feedthrough at HF and VLF performance is not impaired at all. I have never given this a second thought as I believed it was specific for my location. Never too old to learn! transmission line transformer. In a 50 ohm system, it covers 4 kHz (!) to 200 MHz at -3dB. Which is very good. 13 dB. So, excellent for VLF / LF/ MF, it won't do for upper HF. I first tried a FT-37-43 toroid with 10 turns for each winding. work better than my high mu (8300) cores. Nope, it was far worse and at 30 MHz the loss was already > 20 dB. to 3. This yielded a nice bandwidth (-3dB)from 50 kHz to 50 MHz. 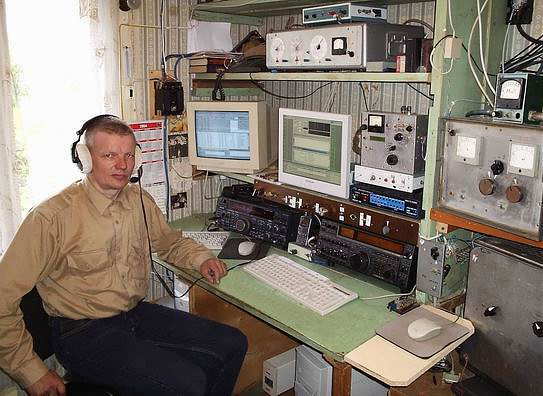 reception of the Russian Alpha stations between 10 and 15 kHz. traditional rf transformers as well! There is no difference between isolated or common grounds either. toroid. At LF / MW, I don't find any loss at all. The FT-50-75 will do fine with two windings of 4 turns each. I have some FT-50-77 cores at hand and will see how they work out. I am surprised at the wide bandwidth that can be achieved. bandwidth ranges from 80 kHz to 50 MHz. For about the same inductance, the FT-50-77 core needs 6 windings. kHz, the upper is 12 MHz. At 30 MHz the loss is already 8.5 dB. 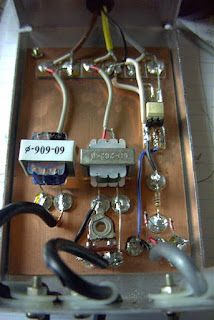 be used for the range 100 kHz - 3 MHz. 5000 and the number of turns should be =< 3.
separate antenna and receiver ground. improved due to lower noise ingress. See attachment. common ground. Harmonics of the 50 Hz mains can be easily spotted. PERSEUS drops considerable below 10 kHz. neighbourhood is also much reduced. An excellent video demonstrating the dramatic effects of isolating the ground in the e-probe antenna system on LF was posted today by PY3CRX. Marcus used the Magnetics hi-mu core with 5 + 5 turns (~ 390 + 390 uh). For those not having access to the Magnetics material, it looks like the BN-73-202 binocular core is a good performer, from 10kHz - 100MHz. The FT-75 and 77 material also fair well but with differing bandwidths. Cores are available from Amidon as well as from W8DIZ's Kits & Parts. Well it seems as if the U.S. Navy has rediscovered something that most hams, especially older ones, have know for a long time ... CW is pretty darn handy! I've always absolutely loved CW, ever since first learning it at around twelve years of age, eventually using my new-found skill to help me get a ticket when I turned fifteen. 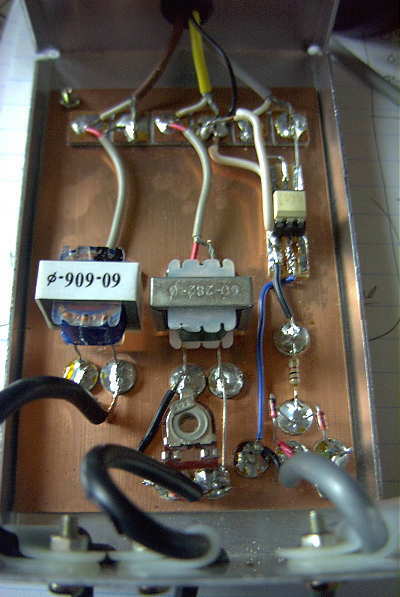 A big stumbling-block for many, the requirement to send and receive CW was eventually eliminated with the introduction of the no-code licence and had many hams believing it would be the end of ham radio. As the Coast Guard and maritimers around the world abandoned CW, somehow, it has managed to not only survive, but to seemingly flourish on the ham bands. 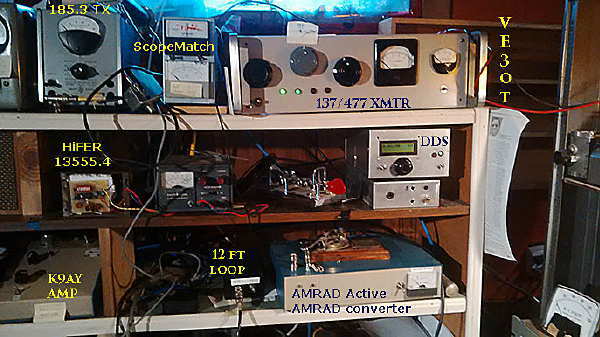 Granted, operating habits and patterns may be changing and fewer stations are to be found, randomly CQ-ing, seeking a nice CW ragchew, but a short listen during any contest weekend or during a rare DX-pedition pileup will quickly reveal that the art of CW itself is still alive and well in 2016! One of the reasons for CW's longevity, aside from the fact that it's just plain fun, is it's ability to be understood under the worst of conditions, unlike many other modes ... and it can be used with the simplest of equipment, without needing a computer. 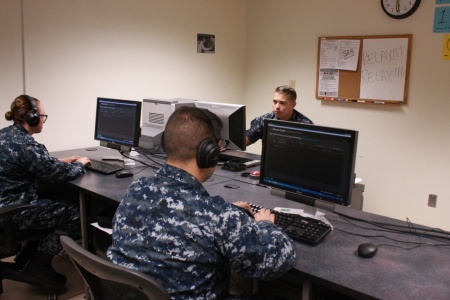 "In the updated course, sailors learn how to operate radio-receiving and associated computer-based equipment. 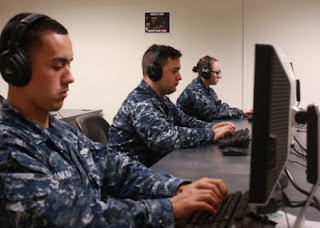 From basic safeguards of security to communication procedures and systems theory to operation of communications equipment, the course teaches how to intercept Morse communications, as well as copy and send Morse code." Somehow, it's very gratifying to see that the Navy is still keen on training sailors in the art ... affirming what hams have known since the earliest days of radio. It's not clear if these folks are learning to actually send with a hand key or keyer but I rather suspect that their sending skills may be limited to how fast they can type as I don't see any keys in the training-center's photos ... but it's a start. Maybe we'll hear a few of them on CW sometime in the future. Friday and Saturday evening's 'Midwinter 630m Activity' event was an interesting demonstration of the band's capability and, by most accounts, a real success. At first-glance, the propagation gods appeared to favor Friday night but I'm not really so sure as both nights were quite different. Friday night's extremely high winds and pounding rain played havoc with most of the west coast antenna systems, producing fluctuating SWR's and scopematch traces dancing crazily for most of the night. Geomagnetic conditions were playing tricks on both evenings as well, with the K-index varying between '1' and '4' ... but the sudden dip to '1' on Saturday night was immediately obvious out west. Stations that had struggled to hear any signs of the CQ-ing VE7's suddenly reported aural reception and several quick contacts were made before calling it a night at around 0700Z. Some of the lower ERP stations were never able to crack the Saturday night, generally high, K-curtain, making for a less interesting night. The highlight of the event was assuredly the activity from Canada's most recent arrival to the band, Mitch (VE3OT) in London, Ontario. A veteran 2200m operator, Mitch recently modified his system to add 630m capability and after a few setbacks, managed to provide a lot of excitement for the crossbanders back east. I'm sure that Mitch's participation has resulted in many eastern amateurs making plans for 630m in the months ahead. 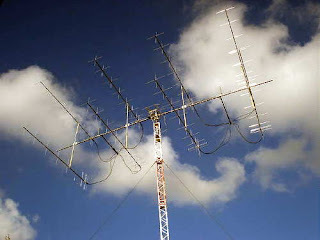 Mitch managed twenty-five two-way crossband contacts, all along the eastern seaboard and as far south as Texas, with his well-heard 200W and 340' backyard loop ... proving once again that you don't need to live in the country with several acres to have a ton of fun on 630m! 'Backyarders' in VE7 land also had fun, with VE7BDQ, VE7CNF and VA7MM working crossbanders across the PNW and down into California, Utah and Nevada. Although my own system can also fit into a backyard (with kindly help from the neighbours! ), it doesn't quite qualify for such description as my antenna is mounted almost over the ocean, with an unobstructed seawater horizon looking towards the rest of North America and to the north. 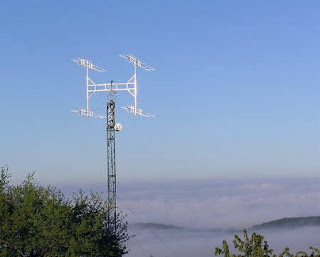 An interesting observation, noticed during previous events and reconfirmed once again, is the ability of the smaller and lower antennas used by some of the city stations, to propagate much stronger signals into closer regions such as Washington, Oregon and northern California. On more than one occasion, my signal was reported as 'unreadable' or 'just above the noise floor', while the other backyarders were reported with, sometimes, 'booming' signals. I can only surmise that these antennas offer more high-angled (NVIS-like) radiation compared with my high seaside inverted-L, which likely has a lower takeoff angle ... Saturday night's activity tended to back up this observation. When it comes down to it, I think that all amateur 630m antennas are basically NVIS radiators due to their small size and low height but some are just a tiny bit 'less NVIS' than others! As conditions enjoyed a short spike late on Saturday evening, NO3M and WA3TTS, both in Pennsylvania, reported good reception of my CQ's and crossband QSO's were quickly completed with both stations, as well as with KB5NJD in Texas. During the short propagation lift, ABØCW, in Colorado, also called in for a quick exchange, indicating that my previously unheard signal had quickly built from nothing to a 549. 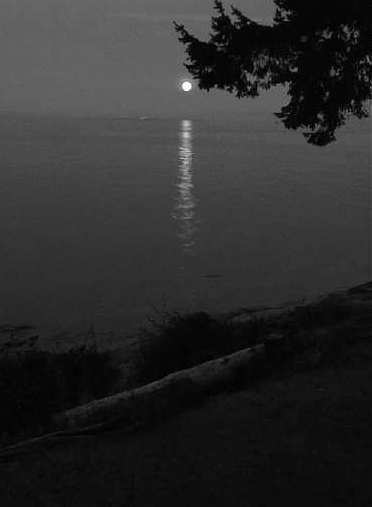 Another highlight of the night was a report from Paul, K7CW, from his quiet receiving location in Tahuya, Washington. Paul reports reception of both VE3OT and VO1NA, with the latter being a 'first' from the west coast! 0204Z - Worked VE7SL 473/3566 kHz RST 559. 0209Z - Worked VE7CNF 476.5/3558 kHz Pretty fast QSB RST 529 to 559. 0214Z - 0409Z WG2XSV 476.1 Beacon RST 559. Announced QRT and QSY at 0409Z. 0219Z - Heard VO1NA 477.4 kHz Weak with QSB. I could get or or three characters now and then. Too weak to attempt a QSO. Signal faded to nothing after about 15 minutes. 0225Z - Heard VE3OT 477.0 kHz Weak but much better than VO1NA. Also with QSB fading to nothing. I called several times, but couldn't tell if he came back to me. Strong enough to make a hopeful try. Also disappeared after about 15 minutes. 0241Z - Came across WD2XSH/20 RST 599+ in QSO with WH2XGP RST 589. 474.5 kHz. 0300Z - WD2XSH/20 472.0 599+ now in beacon mode. 0400Z - VE7BDQ 474.0 kHz RST 539 showed up and called CQ twice. I responded on 3555 kHz, but he did not call me back. He then disappeared from the QRG. There was a strong birdie on 475 kHz, but I don't think VA7MM came on. 0409Z - WG2XSV 476.1 Beacon interrupted by announcement of QRT and QSY. 0434Z - Came across VE7BDQ 474.0 kHz again calling CQ. He worked VA7JX, but apparently couldn't hear me. With that, I took one more look for VO1NA and stopped. Thanks also to AI8Z in Colorado and W7OIL in Washington for submitting reception reports! As well, Toby was copied on QRSS3 mode in Illinois, late Saturday night. For an even more detailed description of the weekend event, see KB5NJD's 630m blogs here. Thanks to all participants ... you have created another successful 630m operating event. Hopefully U.S. amateurs will have access to the band before next winter, allowing all of the two-way activity to take place within the band itself ... how different that will be! Otherwise, another crossband weekend will be in store for the fall of 2016! This coming weekend will host the "Midwinter 630m Operating Activity", an event that will have the 630m band no doubt sounding very crowded. Not only will there be a dozen or more U.S. experimental stations in operation, but also six Canadian stations working crossband with other amateurs in both the U.S. and Canada. Hopefully you will be able to participate as well, by listening for the 630m Canadians and then give them a call on their HF listening (QSX) frequency. Although specific HF QSX frequencies will be part of their CQ, the list below will provide further details regarding where and when the Canadians will be transmitting. This event should be particularly interesting for amateurs from the central states eastward, as well as the southern states. For the first time, a mid-continent Canadian station will be on-the-air for both nights. 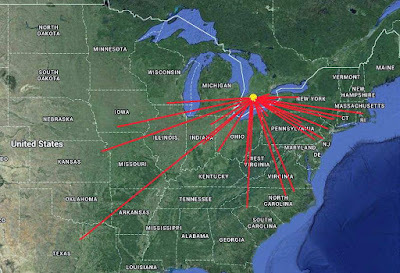 Mitch, VE3OT, will be looking for crossband contacts from his London, Ontario location and looking at the results of his past few weeks of CW beaconing, his 630m signal is being well-heard throughout the eastern half of the continent. For the north-easterners, VO1NA in Newfoundland will be also looking for two-way crossband contacts. The last time this event was run, dozens of two-way crossband contacts were completed between the 630m Canadians and amateurs on HF. Canadians on the west coast worked as far as KH6 to the west and W3 to the east. With even better propagation looking very probable this coming weekend, the crossband activity could be very exciting! 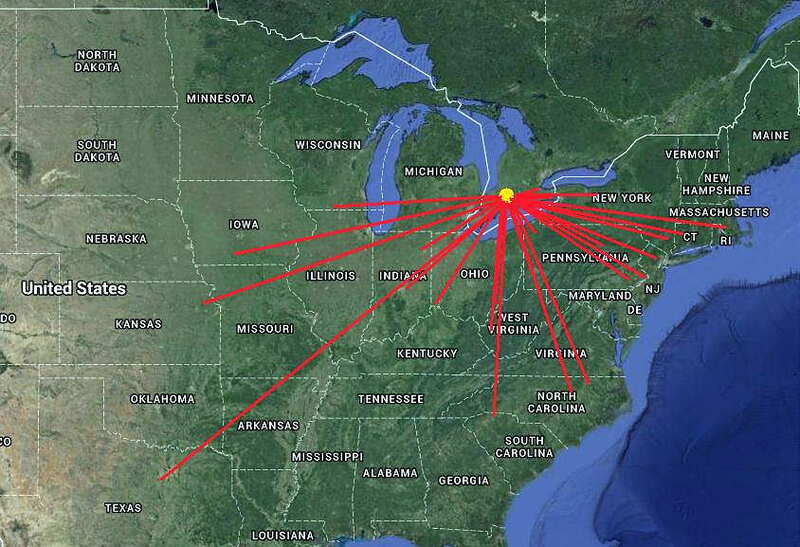 In addition to the crossband activity, the numerous U.S. experimental stations are also seeking your reception reports. These can be either sent to the individual stations (via their qrz.com info) or to myself, for forwarding and posting in the event summary. Several of the old high-powered Californian Maritime stations will also be in operation on CW, just below the 630m band. More information regarding the weekend's event can be found here in the initial announcement as well as on the ARRL News page here. As in past events, many of the participants will be found on the ON4KST (2200-630m) Chat page, allowing realtime updates to keep you in the loop ... the more the merrier. If you are getting ready for the arrival of the 630m band in the U.S., this weekend's event offers a good opportunity to get a 'feel' for the band as well as to participate in the two-way activity with the 'VE' amateurs ... we hope to work many of you this weekend! This past weekend's CQ 160m CW Contest saw the normally quiet band bursting to life with signals stacked up, one atop the other, from 1800 -1870 kHz. At times it was very difficult to find a clear frequency to send 'CQ' and much of the contest was spent in the 'search and pounce' (S&P) mode. When a clear frequency was found I was able to have several short runs but running for any length of time while in the low power category is not realistic. I think my best hourly rate peaked at '60' for a short time as propagation would improve momentarily ... often, ten or more CQ's would go unanswered and then the next one would have two or three responses, continuing on for several minutes until the propagation would shift. These sudden 'holes' in the D-layer absorption seem to occur when conditions are marginal and it's as if the propagation switch is suddenly thrown from 'poor' to 'really good' for a few short minutes. Overall, conditions from western B.C. were poor on Friday night and much improved on Saturday night. Although several DX stations were heard and called on Friday night, none were worked. These same stations came right back when called, on Saturday evening. 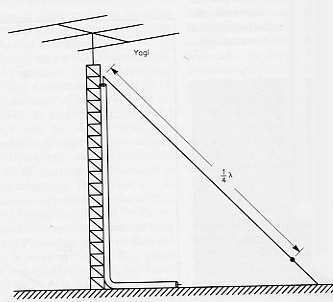 My 160m antenna is very simple, consisting of a 'half-sloper' and about fifty in-ground radials. Since the tower and antenna are mounted right at the ocean's edge, this year I threw two extra radials into the ocean ... whether or not these made any difference is difficult to say but they certainly wouldn't make things worse. Because of the proximity to the ocean and the half-sloper producing vertical polarization, my antenna always seems to favor stations at the ends of the single-hop F2 distance ... those along the east coast and into the Caribbean as opposed to mid-continent signals. I often find myself sending several repeats to stations in the central states while those on the far coast will reply on the first call ... even stations that I can barely copy, will often come right back, which seems puzzling. Overall, about 10 hours were spent in the contest ... ending up with 223 contacts in 51 sections and 9 DX entities. Some of the DX stations worked were PJ2, HK1, ZF2, C6, KP2 and 4V1. 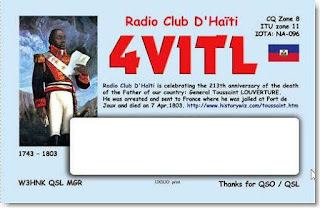 Checking my 160m DXCC list after the contest, I was surprised to see that 4V1TL in Haiti was a new country for me, making the contest time well worth it. Claimed scores for this, and any contest, can be viewed on the 3830 Scores website. As the solar cycle continues to decline, 160m conditions should only get better and better, with the next few years hopefully producing a few Europeans in the 160m log once again.